This page was entered manually from the paper originals in two phases: the overview and the entries from 1 January to 22 January were entered in early 2015, and the entries from 23 to 21 January were entered between 14 April 2017 and 16 April 2017. Items in italics, like this, were added during this time. This is the very first month of the diary that I kept between 1 January 1963 and 1 October 1970. It starts with a summary of what I had done in the previous year, so I'll leave that. This year  saw me into the fifth form at Kestrels [a small prep school in East Anstey, Devon, UK] , where I, as usual, did very well, so well in fact that at the end of the term R. S. [Richard Stapleton, headmaster] decided for me that I would, instead of taking the C.E. [Common Entrance exam] to Kings [King's College, Taunton], I would take their entrance scholarship exam, which I did the next term, with the result that I obtained an exhibition for £45 p.a., and left Kestrels at half summer term, flying to Malaya for an extra long summer holidays, coming back to England on Sept. 4th, being met by U. Bob, who sent use down to Netherton [Netherton House in Combeinteignhead] (Us referring to Bev [my sister] and me). Bev started school at St. Clares [School of St. Clare, Penzance, now defunct] on 12th September, I following on September 21st [clearly I had not yet decided how to write dates], landing in Carpenter house, and form III A, upon the latter being teased unmercifully by Bev (she being in form 3A, though in a different school, of course). [Bev is 28 months younger than I] Became distinguished in chemistry, and a favour of Clod [Mr Morgan], the chem. master. Was in the san [sanatorium] for the last week of term, arrived back at Netherton, and was promptly pursued by a girl rejoicing in the name of Cynthia. Having shaken her off, I began pursuit of a very fair Sudanese, by the name of Nadia. Thus opens the story with me in the coachhouse, and building, or trying to, radios right left and centre (lit.). At the time, my parents lived in Malaya (this was some months before Malaysia was founded), and my sister and I spent many of our school holidays at Netherton House. My antisocial behaviour was clear even then: rather than sleeping with the other children, I choose to sleep in the coach house, above the garage in the stables, which in bygone days had been the room of the coach drivers. The pointer on the Google map shows the coach house; Netherton House is to the east. The reference to Cynthia and Nadia is very much a snapshot. I can't recall seeing Nadia again, but I maintained ties with Cynthia for about 4 years, though she was never my “girlfriend”. When I woke up this morning and looked at my watch, it appeared to have stopped. When I looked at it again, it was going, and registered 9.30. When I got down to the house, I saw Taleb laying the table, thought it had stopped after all, and set it by the clock outside, which had stopped at 11.15, with the result that when I went down to the house for lunch, my watch registered 2.30, when the actual time was 1.00. There was an expedition into the flicks [cinema], Kid Galahad with Elvis, but I went not, but down to the coach house to build it something, and would have done, had not Bev come down, whereupon we became engrossed in conversation. Fawzi soon followed, and Bev insisted on giving a display of her talents (?) on the recorder, whereupon Fawzi did the same on my flute, losing a screw in the process [presumably from the flute] (later to be found). They left at about 4.00, and after a bit of work, I went down before supper by an hour, and James caught me for slosh [I have no idea what that is, but probably some billiard game] and beat me 108-77. Did more work after supper, but returned to the house round 9, and was kicked out by Mr. Barnes at 9.45, whereupon I finished off amplifier, [sic], pulled all old components etc from the old chassis. Included EM84 tuning indicator, ANL after EBC33. O/P valve EL33. 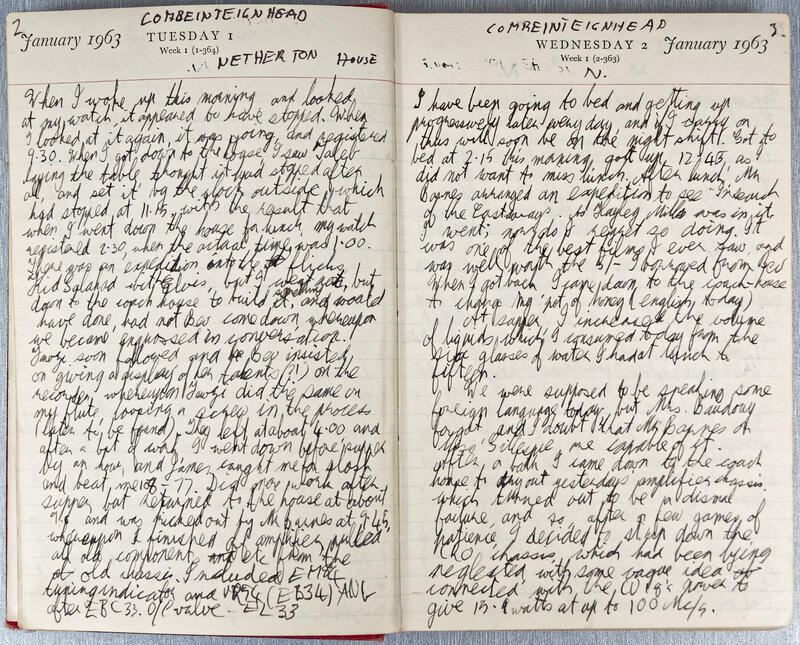 Wednesday, 2 January 1963 N.
I have been going to bed and getting up progressively later every day, and if I carry on thus will soon be on the night shift. Got to bed at 2.15 this morning, got up 12.45, as I did not want to miss lunch. After lunch, Mr Barnes arranged an expedition to see “In search of the Castaways”. As Hayley Mills was in it, I went; nor do I regret so doing. It was one of the best films I ever saw, and was well worth the 5/- I I borrowed from Bev. When I got back, I came down to the coach-house to change my pot of honey (english today). At supper, I increased the volume of liquids which I consumed today from the six glasses of water I had at lunch to fifteen. We were supposed to be speaking some foreign language today, but Mrs. Baudouy forgot, and I doubt that Mr Barnes or Miss Gillespie are capable of it. After a bath, I came down to the coach house to try out yesterday's amplifier chassis, which turned out to be a dismal failure, and so, after a few games of patience, I decided to strip down the CRO chassis, which had been lying neglected, with some ague idea connected with the CV18's power to give 15.1 watts at up to 100 Mc/s. Thursday, 3 January 1963 N.
This morning I carried on the stripping of the CRO chassis, but soon stopped in favour of reading up the ham exam syllabus. Got up this afternoon just in time for lunch, after being woken up by Kevin as usual, to tell me that we were in the middle of a heavy snow storm. He did not stay however, insisting that if he didn't go immediately, we would be snowed in. At lunch, we were refused more than three glasses of water, so we changed over to cider, which I must say was very good. After lunch, there was a snowball fight, in which I for some strange reason, participated. Fairly soon, however, I went up to the tree house, where I found some ready made snowballs, which I chucked down below. Soon I was joined by Puki and Ann Coots. Soon I left for the coach-house, and carried on stripping the CRO. After supper, watched TV for a while, and then came down and tidied up the room, and finally got rid of Bev's stuff. Halfway through the process I decided to design an amateur TV transmitter, and had got as far as the vert T. Base circuits when I decided to read the book that Fadel had lent me, “Hornblower in Captivity”. Friday, 4 January 1963 N.
Rather boring day. I woke up at 1.00 pm, and as a result was late for lunch, nor was any place saved for me. Finally pinched one from another table. Then went Kevin & I down to the coach house, with his soldering iron, to search for a 2 amp 3 pin plug, but were unsuccessful. I did give him a light bulb 2 pin plug however. I wonder how many amps they can take. Should be able to take 100ma anyway. When we got back to the house, and had replaced the iron, found Mr Barnes organizing a trip into town, whereupon Kevin & I joined as Kevin wanted to buy some multicore, I to see town for the first time this year, apart from the film on Wed. In town, after being towed half the way by Fritz, during which time Kevin & I sat on the back of his van, I got 3/- worth of multicore, which seemed to work out, by my calculations, at 8 yards, but was probably 9, and also a light bulb for the radiator. Watched a bit of TV, then wen own to the coach house, to reply to a letter from mum & dad, in which I was allowed more money. After this, started working on power supplies for transistor radios. Also stripped I some more of the CRO. Saturday, 5 January 1963 N.
Today was more than usually boring. Kevin was feeling decidedly unfit, after catching a cold from Puki. After lunch, organized a trip into town to see “Castaways” again, and also bought a new PP7 (old one was down to 6.8V, bit I am now leaving it on charge). Puki was kind enough to buy some chips for us, andthen Anis shared out some more. Taleb gave me an old PP3 to charge, which registered 1.9 V, and I thought there was no hope for it. After leaving it on charge for a while, however, it was up to 8.9 V, and only down to 8.8 V after 10 secs short (8.3V now). PP7 up to 8.9V, but I don't think I can get any higher than that. I knocked over the radiator this evening, with the result that I knocked the 2A socket clean off the wall, and learnt something about 2A sockets when replacing it. I have decided to build a class B amplifier supposedly capable of delivering 3/8 watts with a CV18. Sunday, 6 January 1963 N.
I was rudely interrupted in my morning hibernation at the unearthly hour of 9.50 am, by Paul, with the news that I should hurry up and get dressed, or I would miss church. I finally staggered down to the house, and had to wait a quarter of an hour before we finally left. When we arrived back at last, I just went back to bed and stayed there until 1 pm. Kevin was feeling pretty rotten today, and could not even keep his lunch down. Nevertheless, he insisted on staying up, although I don't feel it did him much good. Mali and I, feeling fed up as usual, decided to go for a walk, and finally ended up at the coach house, the long way. After getting warm, we went back to the house, in time to find everyone going sledging. I watched TV. After supper, I carried on with this, and noticed that Selma was trying to get ahead with me. Of course I responded not. In the end I went up to clean my teeth and popped into the girls dorm, per usual, and found Cynthia in great distress. Apparently she had been running round the room naked, when a boy popped his head in. She suspected me, but unfortunately I had not the pleasure. Afterwards, I decided to tidy up the room as I had never done before, but quite frankly I don't think I'll do it. Monday, 7 January 1963 N.
Today I woke up, went down to the house, to discover that Bev had a letter for me, though it contained nothing of interest. After lunch, at which I was informed by Kevin that he must be getting better, as he had not yet vomited today, I came down to the coach house, and decided to post some long overdue letters. When I came down to the house, I found Taleb trying to play billiards, insisting that it was his 11th birthday. It developed that his birthday had not been recorded, and his age was somewhere between 9 and 10½. His sister, however, did definitely have a birthday today, and quite a celebration. There were the usual games, etc, of the part (all this was in the cellars), and then the real stuff began. A tray was spun and the person named by the spinner had to catch the tray before it stopped spinning, and was rewarded by kissing the spinner. Then we had the process of standing behind the girls and keeping them, only this time with kisses at stake. Got Miranda, Judy, Ann King/Coots, Jean, Nadia, Virginia and Cynthia. Came down to the coach house, and decided to tabulate 10 fig logs. Tuesday, 8 January 1963 N.
I was woken up at the unearthly hour of 10.50 am this morning, by Mr Barnes, inquiring if Charles was in here. After I replied no, he left me. Mali taught Bev & Cynthia how to play snooker after lunch, or tried to, during which time I entered well and truly into Cynthia's bad books. After this there was an expedition to see “Kid Galahad”	by Elvis. Not bad, but as a result I arrived home late for Supper. There is going to be 6 days of “Sodom & Gemorrah [sic] (X) next week, and I must try to get to see it. Mrs Baudouy made an attempt to tidy up the coach house today, a attempt in which she was not altogether unsuccessful, although she did transfer all of my tubes t another position. I wonder what she would have done if the VCR97 had imploded in her face! I persuaded her to give me a Dewar flask full of coffee for breakfast (2.30 am) tomorrow, or rather, I persuaded her to suggest it. When she tidied up the room, she somehow or another managed to knock off the 2 amp socket, and I had to completely resite it. At about 11 pm, decided that I could catch up on my clarinet practice, and did. Wednesday, 9 January 1963 N.
After getting into bed this morning I read an article in P. Wireless	about M.W. DX, and plugged in the antenna, to find that American stations were coming in loud and clear. I went on like this until about 4.30, when I could not get to sleep, and so carried on reading “Foundations of Wireless” until about 6.45, when I unplugged the antenna (too much QRM otherwise) and tuned in BBC. When I arrived in the house at 8.00 am, Miss Gillespie nearly fainted. After breakfast, we went into town to get a PW and Wireless world. It was a bitterly cold day, with an equally cold wind. After lunch I called on on Kevin to help me put up a very long-wire antenna, which reached over 150 yards. He got so cold that he left 2 of his cognac sweets which he bought this morning, in the coach house. I polished them off later. At about 5 pm, after tea, I came down to the coach house, lay down, and was out like a light until 9 pm. After being awake nearly 29 hours, and the first night in my life where I did not sleep a wink. Later I came down to the house, where I got a bottle of coffee and one of hot water. I did not try out the new antenna, nor any DX, as I thought I had a dental appointment tomorrow, and so got to bed at only 12.15. Thursday, 10 January 1963 N.
I woke up the morning quite early, 8.00 am in fact, and so managed to get some breakfast. At about 9.40, Mrs Baudouy told me that our dental appointment was not today but tomorrow at 10 am, and all this after I had reminded Bev, who had completely forgotten about it, and received the shock of her life. I received the news with mixed feelings: put off, but I would have to get up for breakfast again tomorrow. The billiards table was on rest today, but this fact made no odds to some people. I fined Luc & Puki 1/-, William 2/-, and upon which Bill complained violently, and we still have not got over it. When In [sic] the afternoon I came down to the coach house I decided to design a good communications receiver, which included 432 Mc/s and 144 Mc/s, Xtal filter, etc. It took me all afternoon for the prototype circuit, and then I went up and had a bath. After supper, which followed, I had to watch TV for a while until I could borrow Puki's compass, and then I made a bish of the chassis layout. In the process of circuit diagram I made the interesting discovery that bands on a communications receiver are determined by the factor log √f. Friday, 11 January 1963 N.
This morning, despite my attempts, I found it impossible to get to sleep, and stayed away all through the night, and arrived down at the house just in time to miss laying the table. I stayed in breakfast for a long time, while Anis related various stories of what went on in the Rugger senior colts at his school. When we got out, it was 9.40, and our appointment was supposed to be at 10. We arrived at 10.30 and finally got seen to at 11.30. I was most surprised, almost shocked, to find that I had no cavities, and Bev only had two. The dentist told me that I should get Gibbs Fluoride toothpaste, and so got some, but Bev insisted that it tasted foul, and didn't get any. In the afternoon, directly after lunch, I came down to the coach house, went to bed, and slept until 8.0 pm. Saturday, 12 January 1963 N.
This morning I woke up to find that my watch had stopped at 2.10 am, and I had no idea what the time was. I turned on the radio, but all I got was a heated political discussion on Berlin by radio “Deutsches Demokratisches Republik [sic]. A few hours later, I got Home, which had just started. By this time I had decided to make a list of all the valves I would need in my radio ham setup, which worked out at 37 valves costing a total of £18··11··0, the cheapest being 2/6 for a6C4, and the most expensive 43/6 for a KT84, and the average being 5/-. After breakfast there was an expedition into town, but I went not, but did a redrawing of the circuit diagram of the comm. receiver with amendments. VHF section - 6×6CW4, OC2, ECC81, 6AM4, R.F. 3×EF93, ECF80, OB2 IF: 3×EF93, EF94, Detector/AVC/ANL: 3×ECC83 4×EB91, OA2, ECF82, AF: ECC83, 6BW6, Power 5R4GY EB91 - 32 in all. After this I managed to fit al of these on a 14"×10" chassis quite nicely. There was supposed to be a fancy dress party tonight, and I was told it was for the over 15's, but I was the only 14'er who did not go. Actually, I got to be about 9.00 pm, and went to sleep almost immediately. Sunday, 13 January 1963 N.
I woke up at about 8.45 today, but I did not get out of bed until about 9.10, and was just in time for breakfast. I did not have a clean white shirt, so I had to go down to the coach house and changed after breakfast. When I got up to the house again, I found Bev still in bed, and refusing to get up. I went downstairs, and went into the playroom to talk to Kevin. When I came out again, to ask Mrs Baudouy whether Bev had got up yet, I was greeted with the news that not only had she got up, but she had also gone to church along with the rest, and I had been left behind. I carried on the morning playing poker. Afterwards, when Puki came back to the house he insisted on my making his motor connect to the battery both ways, which I did. Lunch was later, and Puki & I decided to set up an antenna. When we came down at the appointed time, Mrs Baudouy offered us some cider to set the table, which we accepted. After lunch we carried on with the antenna, which when finished produced truly surprising results, so much so that Puki thought that something was wrong: when we he plugged in the antenna he received stations load and clear that were inaudible before! in the evening played jackpot with Peter. Then had a conversation later, he is a New Zealander! Also Sports Master at some school. Monday, 14 January 1963 N.
I got up this morning, true to tradition, just in time for lunch, at 1.35 pm, and then went with Peter, Fawzi, Luc and Brian down to the bogs, to skate on the ice which had formed there. I had my thongs on, and apart from being frightfully cold, they gripped the ice too well to skate in, so most of the time I was pushing Brian over, or talking to Peter, from which it developed that he taught Latin, Algebra, and English, as well as being a sports master. When we came back, there was an expedition to a film for Peter to arrange, but I went down to the coach house to review the communications receiver situation, and in the process found some “C” core Xformers rated at Primary 230 V Secs 510-0-510 V@275 Ma, 375-0-375 V @83 Ma 6.3V 9 A, 6.3V 2A, 6.3V 2A, 6.3V 1A, 6.3V 1A, 6.3V 1.5A, 6.3V 0.5 A, 5 V 3 A, going for the bargain prices of 32/6, but postage amounts to 10/-, as it weighs 25 lbs. As a result, I set my heart on it, and proceeded to think out a power supply around it. There was a fancy dress party in the evening, and I went in a sarong etc, but it was rather boring, and I spent most of my time talking to Peter, who appears quite scientific-minded, and would like to share the coach-house with me in the Easter, and we could perform various experiments together. Tuesday, 15 January 1963 N.
I slept not this morning, but dropped off for a while at about 8. am, and woke up just in time for the end of breakfast, when I was informed by Simone that I would not be going back to school on Friday, as it was snowed up, but the following Friday. After breakfast I went down to the coach house again, and went to sleep until 3 pm, and thus missed lunch. When I got up, I carried on stripping the CRO power supply, in view of using the components in my contemplated power supply unit, and found that they were extremely difficult to remove, it taking me just under an hour to remove the 8µF 2kV condenser, and then went down to the house, where Mali asked me where I had been, and told me that Kevin had left. He then attempted to reclaim a cake from Fawzi, which resulted in a 40-60 success for Mali, and the tea gong went just as he was dividing it, so we managed to get some out of him for tea. After Mali and Peter had attempted to kill each other, I went so crazy with hunger that offered to set the table for Mrs Baudouy, and also I managed to get two suppers, and then went to the tuck shop, and spent 2/6 in one binge. After lights out, Bev and Fawzi went into open pursuit. Fawzi tried to kiss me, and she and Bev did kiss Fadel, to his surprise. Wednesday, 16 January 1963 N.
I was rudely awoken by Fawzi this morning, at the unearthly hour of 10 am, who demanded admission, and when she did enter told me that Bev had already left, and then started a conversation. Five minutes later entered Bev, enquiring whether I had really believed Fawzi, and appearing quite surprized [sic]. Then the said that the boys were waiting for them, entered Paul, exeunt girls, Paul said that Puki wanted me to clear out, so he could snog with Fawzi, which was rejected. After lunch, Bev came down to the coach house to tidy up the hamster's cage, and asked me to watch her expert care of not getting bitten, when Brian came along to tell me that I had a monstrous parcel waiting for me down at the house (PCR2), and dashed town to get it. When I came back, Bev's finger was streaming with blood, and she was asking for a handkerchief. The receiver was tightly packed in straw, some of which Bev used for her hamsters cage, but the rest of which was burnt. The PCR had RF EF39 Mixer - ECH 33 2IF - EF39, Det/AVC supposed to be EBC33, but mine had a 6Q7G, O/P 6V6G, rect 6X5GT (in seperate [sic] power supply. One of the EF39's was in poor shape, cap coming off, no locating pin, and thus was changed. 6V6G was loose from the base, as was the ECH35's top cap. I had to connect up the speaker internally. Thursday, 17 January 1963 N.
When I came down to the house today, I was informed that the chimney had just been on fire, and when I went in, Mrs Baudouy was still removing the last burning coals. Mali, seeing me, informed me that he had finally refound my socks, and finally gave them to me. At lunch, we sat at the small table for the last time, although a rather deplenished mob: Mali, Peter, Luc, Fadel, Paul, and I.
I decided to go onto town today to get material for building a 102 antenna, and went with the mob who went to say goodbye to Peter, who went today, accompanied by Paul. I should have been able to make something better of that. We decided not to go home with the other mob and then discovered that today was the weekly half-day, and after having some food at a café, went along to see when the next bus left the terminus. We arrived at 4.21, were told that the last had just left, and the next would leave at 6.10, and so decided to go home along the river. We arrived back home at 5.15, frozen stiff, Paul having strained a muscle when slipping on ice, of which there was a lot down by the river. 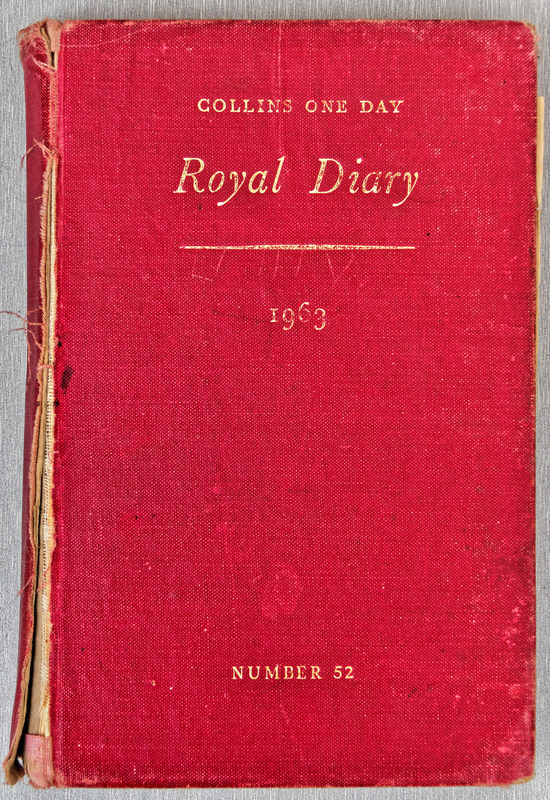 Friday, 18 January 1963 N.
I seem to have got into the habit of filling this diary every two days, and doing both at the same time. I am for instance, doing both to-day and tomorrows at the same time. I woke up late for lunch today (or, at least, I couldn't be fagged to get up on time, and discovered that Mali had left in the morning and I had not had the chances to say goodbye to him. After lunch, I decided to go into town to get the stuff I was going to get yesterday. Gui only went down to Torquay road, so I had to walk the rest of the way. When I got to town, I discovered that, although coax was 9d yard, as I had thought, flex was 4d yard instead of my estimated 2d. Also, coax sockets were unobtainable. The total, complete with bus fares, etc, used all but 3d of all my money. It was bitterly cold when I got home, and, rather than go the long way around the house, I took a short cut across the fields, and got myself into a beautiful mess with 70 odd yards of wire which were supposed to resemble an antenna, and finally got them sorted out. In the evening, I worked on the PCR, and found, to my delight, that the phone jacks could be adapted to my type of plug, and connected the one, which was not used, up. Also put in ANL. Saturday, 19 January 1963 N.
I was once again late for lunch today, and afterwards enlisted Paul to help put up the antenna. After a good deal of consideration, we decided to suspend it in a south-soth[sic]-easterly direction, and found a nail which was just below the coach house window, which was an ideal position to put one end of the pole on. After about an hour and a half of Paul climbing up and down trees, and me freeing caught wires from trees, we finally got it right. Then came the problem of feeding the mess. In the end, I drilled some holes in the window frame, and put them through there. However, the coax was more than ⅛" thick, and it took about half an hour to finally connect it up. In the 5.30 news, I heard something about voltage reductions, and checked the line voltage, which was down to 220V. No wonder the radio didn't work well. Then, after changing the taps, I found that the EBC33 and EF39 had 12V across them. Each of these drew .2A. However, the 6Q7 which had been substituted drew .3A, and left little for the EF39. As a result, I connected the 6.3V tap for the ANL across the middle, and all was well. I also put a muting device on both phone jacks, and let speaker and 6.3V tap through other holes. Sunday, 20 January 1963 N.
My slumber was rudely interrupted this morning by Puki, who “just wanted to come in to say hello”. He was followed by Paul, and, both sitting on my bed, wrecked it. To crown the insult, Puki went off with my key, for which he never shall be forgiven. After lunch, I hauled Paul & Puki down to the coach house to make my bed for me, while I made a BFO subchassis for the receiver, and Puki displayed his stupidity. The reason that Puki had come down for was to lend some bostik for my speaker, which did a good job, and then was left behind. The BFO was inserted, etc, and did not work, whereupon I decided to use the old comm. chassis for power supply, tuning indicator, BFO, etc. I spent a greater part of the evenining [sic] attempting to do this, and retired at about 0200 hours, having drilled about a dozen superfluous hols in the chassis, stripped down the old power supply, put two transformers, mains filter, fuses etc. on. The HT filter was comprised of 12 µf - 5 H - 12 µf - 10 H -8 µf, and seemed to have ∞ resistance to earth, despite the 32µf capacity. Monday, 21 January 1963 N.
I was awoken by Miss Gillespie at about 1200 hours demanding to be admitted to pack my trunk, which she decided not to but to pinch my pyjamas instead, and keep one awake long enough to smother me with insults, and to order me to get my books in my trunk by 1300 hrs, or they would not go. Eam ignoravi. At lunch, Anis was talking of his first impressions of Netherton, which somehow developed to a discussion of who should use the billiard table, and developed from a discussion into an argument, and I only tore myself away at about 1500 hrs, leaving William and Alain to carry on. I noticed, on my way down, that the river was frozen up from shore to shore, and met with Miranda, Ann, Anis, and Gui on the way down, Miranda getting me with a snowball. (There has not been one snowless day this year). I finally finished the power supply with a few hours more work, and had it connected up by 1800 hrs, but, although it could be used, the tuning indicator did not work properly. I put it down to faulty AVC. Alain borrowed my battery charger, and gave a few views on the 5 kW transmitter which Miss Gillespie had suggested. 3C×2500A costs £40 rectifiers to £24. No, I don't understand either. When I turned on the standby switch for power supply, transformer burnt out. I woke up this morning at 2.20, and, just as I was lamenting the loss of my lunch, Alain came along with the news that it had been saved for me. After lunch Miss Gillespie came along to help me pack, but after while I went along to have a bath. I got out about 3.45, too late for the 3.35 train, gathered up my sponge bag, etc, and went down to the coach house with Alain to get my trunk, which job took us about half an hour, and headed back to the house, in time to get about 33/- from Mrs Baudouy, and the, after spending 3/- at the tuck shop, and tea, and then collected 10/- for a deutsch dictiorary from Mrs Baudouy, and then hopped it, to Ann Cootes apparent great distress(!). When I got to the station, there was some reserved compartments on the train, and I , for some reason, entered the same compartment as Robinsons ii and iv, who slept most of the way. When we got to Taunton, I got onto the wrong bus, and was so disgusted that I walked the rest of the way, and quite enjoyed it. There are three new boys, all in the east wing. One of them, Akhavan, seems to be an interesting personality. As are most days at school, today was a very boring day. At breakfast lineup, the unusual figure of Green went to its usual place. During breakfast, Akhavan was as inquisitive as seems to be his custom. During bedmaking Mr Gilkes called into the dorm to see if I could come into his room after bedmaking, which I did, to find his electric fire having blown a 13A fuse thrice. The flex was at fault, but as I had no time, I was told to come back during rest. In break, Jacob came up to me and asked if I thought it a good idea to try and go to a catholic church on Sundays, to which I agreed. Boris, in english period, gave us some brand new copies of a novel, Typhoon. Wonder what they'll be like. Managed to fix up Gilkeses radiator. The flex was unusually thick, and it took me some time. I bought a 1lb bottle of Marmite in the avo, but at assembly for supper dropped and shattered it chiz chiz. I bagged a prep place next to Green. When he finally entered, just after Stamp had asked where he was, he regained his breath and promptly went to sleep until I woke him up at chapel. I did the same in 2nd prep. Today was even more boring than yesterday. To start with, I didn't hear the bell, and got down to the common room very late. Double Deutsch was not as boring as it sometimes is, with Tyson nattering about the Warsaw Concerto having a style too like Stravinsky, and asking why we didn't know our Lieder, to which we asked who he was, then. During break, we were unsure whether we were supposed to be inside or outside, took the benefit of the doubt and stayed inside. This was a particularly cold winter, with snow on the ground until March. In divvers, were told we were about to be handed over to one of the new masters for Thursdays, but the Chaplain carried on this time. In Chem, did some work on constant proportions, but nobody seemed to catch on apart from me. We were supposed to go for a walk today, and I went with Akhavan. Unfortunately he met up with Noorvash, and the two were nattering away in Persian for the rest of the afternoon. When we came back, and as I had a hole burning in my pocket, we went along to the tuck shop and I got some foood [sic], and were nearly late for the next periods. In the evening, during second prep, just as I was reading some interesting chemistry book, the lights failed, and we spent the next half hour in darkness, which did not end until Sanderson was about to announce “candles out”. Today was even more boring than yesterday, which is saying a lot. After breakfast, Perryman told me that my services were required by the linen room. When I got down there, a basket of clothes and (mainly) books awaited me, to be removed by small instalments. I took one lot down, and tried to enlist Callows' help to being the rest down during rest, but he brought out the cast iron alibi that he would be pioneering. The Pioneers were a small group of people who preferred to do something useful rather than play sports. In break, we had to go outside, and even Green did, and we spent some time nattering about nothing. After lunch, I managed to enlist the aid of, of all people, Green, to bring up my muck, etc. Again we had to go for a walk, again went with Akhavan, but this time less Noorvash, and what conversation there was ensued in english. When we started prep, every little flicker of the light was carefully watched, but to no avail, nor power cut. Second prep was, of course, choir practice, which, as I have been promoted to an alto (or demoted, whichever way you like to look at it), bor [?] a new light for me, and, as they are hard to get, I pinched a full music edition of the english hymnal from little, and all proceeded well. The responses in the Sunday evening service have been changed, and so have many other things. Today was Bevs birthday, but I completely forgot to send her a card. During break the signs of a thaw became quite evident, despite the fact that some very long icicles had grown on the front of the new building, and I, for one, was wondering when we would have to start playing hockey. Games time was, as usual, a walk, but, as I did not have to go until another quater of an hour, I went to the tuck shop, and bought a scarf. As Green was also there, I waited for him, and when he went outside, I went dow to the linen room to complain. The outcome of this was that Matron was going to switch my and Perrymans mattresses, and do it tomorrow during breakfast. But the time she had finished nattering, it was 3.10, and I went back, escorted Green to the linen room, returned again, and went inside. After tea Callow & I went to the tuck shop and proceeded to gorge ourselves until roll call, after which we returned, and started a conversation, during which I discovered that his (Callow's) father designed the Segamat rest house, and also many other things. Green soon came down to find out the reaction for SO₂ [subscript unclear] and K₂Cr₂O₇, and was kicked out. In second prep, we were told to go into the Upper Common Room, and ended up round the billiards table. Today was as uneventful as ever. In the morning, matron was supposed to do Perryman's bed, but just as I had worked mysefl into a state of excitement about it, she forgot. When I came into the common room before breakfast I noticed a large hole in the window above Daw's scob, with a large piece of ice in it. Apparently a fall of snow off the roof rebounded into the C.R. Wind band after chapel, and we attempted to do “My Fair Lady”, but it was only an attempt. At last I realised how unexperienced the brass mob were. The woodwind did everything in accordance to the rules, but not the brass. To complicate things, my G♯ key stared leaking. In the afternoon, Skiv called Green and Walker ii over to Gatcombe, and put Green in the East wing and Walker into the Headmasters House. Directly after this I went over to the linen room and Matron and I changed the mattress. There was a film, the name of which I have forgotten, about a mob of rebellious Byees, and as a result, all the people have started to speak with an “indian” accent. I have no idea what the correct spelling is; probably something like Bayi. It was a somewhat derogatory name used in Malaya for the Sikhs, though I think the name has the same root as “Bengali”, and thus has nothing to do with the Panjab. We had to changed our K.D.s today, not eventful, but a nuisance. From writing up two days at a time, I am now doing it two days later. Today, owing to CCF, was almost completely uneventful. In the morning, Green was designing an LC oscillator circuit for running computers off, which he insisted would be very accurate and stable. The circuit? A simple parallel one. In break, he was still carrying on about it, and as a result spent most of my time talking to Callow. In chem, after break, Clod gave us the news that there was only one question in the book that no-one had ever been able to do. That was just what he shouldn't have said. It spurred me on, and I had the question finished in the next period, which was PE. In the afternoon was the inevitable corps, which took a long time and nothing much happened. Hobbs did, however, promise to bring some colour plates of people who had been asphyxiated, and we are all waiting on it. When all was finished, the time was only 3.30, and we were kept in for want of something to do. Eventually the found it with the result that we all got out late. Mr. Gilkes came up to the dorm tonight, and attempted to teach everybody bridge. Today was an extremely boring day, but did have a few highlights. In the morning, latin, etc, were uneventful. Green was silent in break, but Callow was nattering about something to me nattering on transformers in parallell. After break, when we went up for physics, we noticed a large number of balances, with which Poop tried to teach us to weigh, but failed. The balance he used for demonstration was so worn down that he could not weigh properly, but we finally got down to the experiment, the main purpose of which was to teach us how to weigh for tomorrow's chemistry practical. During rest, Sandercock came up with some miniatures of last terms photos, and dealt them out. Robinson was jealous because I had four, and he only had two. After that, in came Mr Gilkes to get volunteers for the library moving, explaining that volunteers would be let off the the first part of the walk. I volunteered. After this I went along to see if I could get my clarinet lesson time changed, which I could, and went in at 3.30, as Hobbs could not make it. Today was more eventful than usual, but so are most Wednesdays. To start with, we had a chemistry practical, in which we were supposed to verify the law of constant proportions. Howlett was my partner, and together we had our results before some people had started the reduction. Green was complaining bitterly at break because he had no decent subjects. Nor did we - English, Geom. In the afternoon, after I had bought some Gym shoes, Callow decided that I would go for a walk with him, and so I did. Callow had some biscuits at the beginning of the walk, which he asked me to help consume, which I did at such a rate that by the time we had got back to Fullands we had consumed the lot. During tea, Green and were wondering what happened to the handbook of chemistry and physics, and Green had the brainwave of asking Jacob. We went to the Fox Upper in the chance but he might be there. The fellow we asked called out “Hey Jacob, there are a couple of your little friends here.” It turned out that sister had returned them for me. At the library we had 4/6 fines. Daw bought a Unique 54L slide rule. Today was a rather boring day. Double deutsch was first, in which Tyson had one of the new masters in the period, Mr. Millner, I think, but neither Green nor I are sure. He didn't do much. In english, Boris was discussing Typhoon, and ended up without giving us a prep. In break Green was by no means well. In fact, he looked half dead, and so Callow and I decided to take him over to the san, which we proceeded to do. Divvers was after break, and we had Mr. Millner taking us. Quite an impressive and forcible character, but the wrong type. Mears [?] took us for chemistry, as Clod could not make it. He set us 3 questions, and told us to tell him if we finished. I did, and did 6 more before the end of the period. In the afternoon, I did not feel like going for a walk, so went to the tuck shop to buy a new pair of shoes, and discovered I took size 11. Also got a lot of other muck, including a pad on which I proceeded to write a letter to Mum & Dad, but which has still not been finished. No flute today. Mr. Livingston showed up.